The Electronic Signature Terminal (EST, patent pending) is designed to be placed on the front desk of a professional health care office. As the patients walk into the facility, they "sign in" (using the stylo-pen provided) and seat themselves waiting to be assisted by the Doctor. Once a patient signs their name on the terminal, our simple to use software takes over from that point. The visible signed name then, disappears so that the next patient cannot see who signed in before (unlike manual sign in sheets). 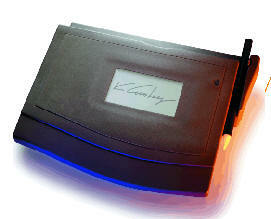 Once the signature disappears from the sign in terminal, it reappears as shown below on the receptionists PC monitor. 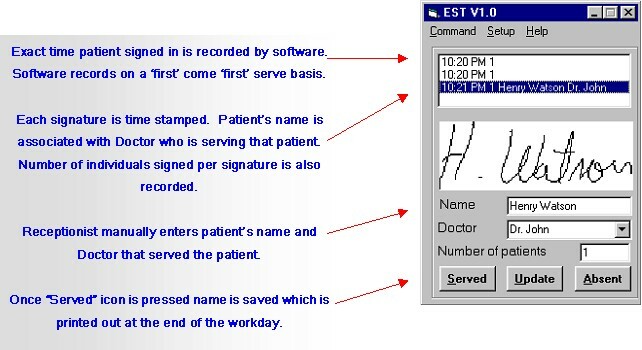 EST's easy to use software enables you to serve all patients as they come in on a first "sign-in" - first "come" basis. Hot keys have been implemented to simplify serving all patients. Once the "served" icon is pressed all highlighted signatures are sent to a temporary database that you can view and print out at the end of each business day. Below is an on-screen print preview sample (Please note: actually print will contain 43 signatures per page with higher signature definition than shown below.). 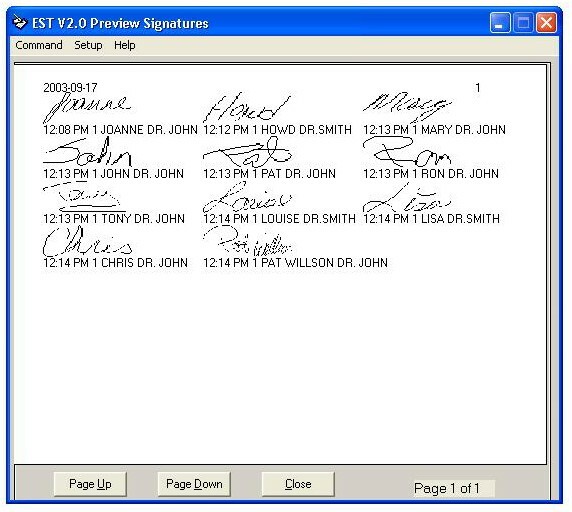 All served signatures are erased from the host PC once a print out is established to ensure HIPAA compliancy. All signatures rendered daily are encrypted. 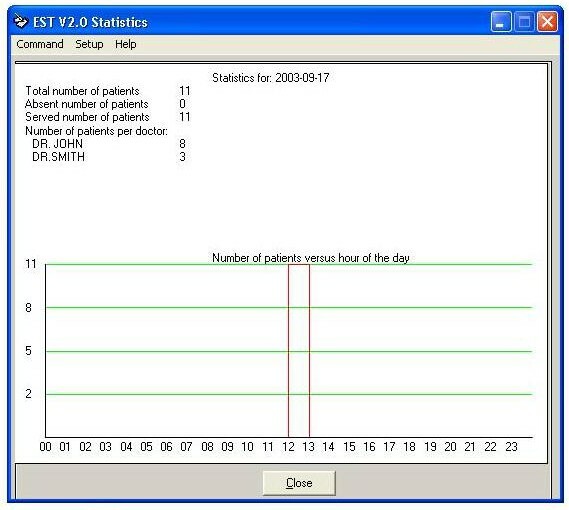 EST software provides health care offices with a unique option that will enable the user to print out "statistical" information. The "statistical" information can provide critical daily information for an office manager. This information once printed out can serve as a powerful auditing and quality control tool. The sample graph below shows an hourly graphical summary of patient inflow rates (number of patients vs. time). Statistical summary shows the number of patients served in total, the number absent, and the number of patients each individual Doctor has assisted during that day.